Cook pasta according to package directions, adding dried tomatoes the last 2 minutes of cooking. Drain and return to saucepan; keep warm. Meanwhile, in a large skillet heat 1 tablespoon of the butter and olive oil over medium heat. Add asparagus, Brussels sprouts, broccoli, and mushrooms. Cook over medium heat for 8 minutes or until vegetables are tender. Remove vegetables from skillet; set aside. In same skillet melt remaining butter over medium heat. Stir in flour. Cook and stir 1 minute. Stir in milk. Cook and stir until thickened and bubbly. Stir in Parmesan cheese. 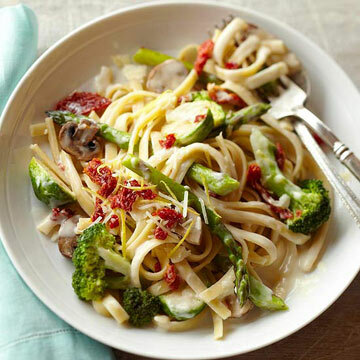 Gently stir in pasta and vegetables. Stir in additional milk to reach desired consistency. Sprinkle with lemon peel and additional shredded Parmesan cheese. Makes 4 (1-1/2 cup) servings.